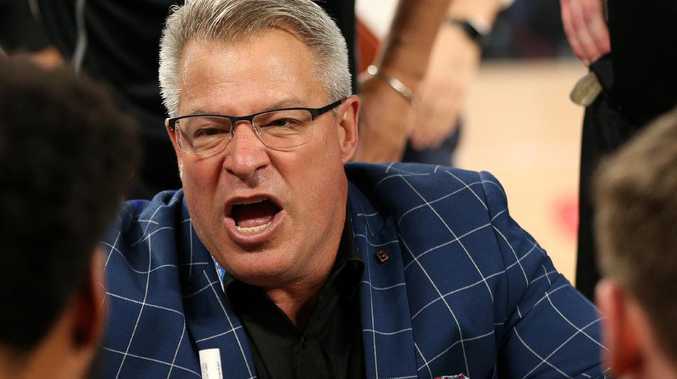 Melbourne United coach Dean Vickerman during Game 2 of the NBL Grand Final series between the Perth Wildcats and the Melbourne United at Melbourne Arena. 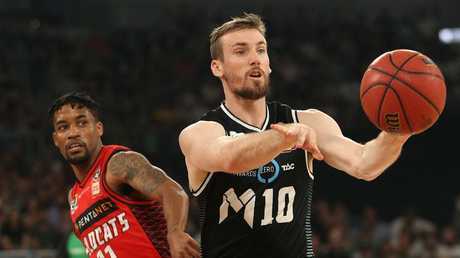 MELBOURNE United has given Perth Wildcats a taste of what to expect for the rest of the NBL grand final series. United levelled the best-of-five series 1-1 on Sunday by running Perth ragged at Melbourne Arena after half-time. It allowed Mitch McCarron and D.J. Kennedy to wreak havoc at both ends of the floor. The Wildcats were unable to match United's ferocity. Quick rotations, aggressive drives and sprinting in and out of screens compounded the visitors' woes. McCarron relished the intensity after being reduced largely to a spectator's role in Game 1 in Perth because of early fouls. United's ability to spread the floor often created open shots for McCarron, Chris Goulding and David Barlow. "It was just a result of our ball movement and aggressiveness, I think," McCarron said. "We know when we're all aggressive and we penetrate, we're an unselfish team, so when it's your turn to step up and knock down shots, you've got to do it." Wildcats coach Trevor Gleeson lamented his side's heavy legs after the loss. "We looked like we had feet in mud," Gleeson said. "I don't think we had enough desire to get the ball, which is disappointing. You're in this finals environment and you're getting outworked." United coach Dean Vickerman praised his team's ability to absorb a "taxing" style. Centres Josh Boone and Alex Pledger worked over opposite numbers Angus Brandt and Nick Kay, with help from athletic bigs Kennedy, Barlow and Craig Moller. "I wanted to play Josh Boone in quicker minutes tonight because what we're asking them to do right now is pretty taxing," Vickerman said. "Continually having to sprint into screens and sprint out of it, to be aggressive with (Bryce) Cotton, so we're asking them to do a lot of work. "Alex's production in 11 minutes was outstanding." Boone and Pledger combined for 18 points and 16 rebounds, working over Wildcats Angus Brandt and Nick Kay.